MLB Trade Rumors recently released their top 50 free agents and where they think each player will sign. They had a competition where fans could submit their predictions to win prizes. Here are my predictions for the top 50 free agents. The Giants trade for Cabrera: The Giants traded Thomas Neal, a prospect in that has a good chance to be a solid 4th outfielder for Orlando Cabrera, a guy with -0.7 fWAR and a -7.2 UZR. Yes, the Giants need middle infield help but Cabrera should not be playing on any contending team and the fact they gave up a prospect for him makes the deal even worse. This is after they traded Zack Wheeler for Carlos Beltran. Sure, Beltran was the best position player available but they get 2+ months of Beltran and no compensation pick and lose a potential top-of-the-rotation starter with 6 years of control. 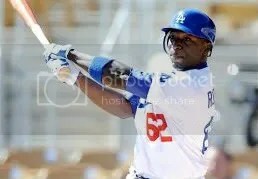 The Dodgers give Robinson away: The Dodgers apparently love to give legit prospects away for bulk prospects with bench potential. They traded Trayvon Robinson who was hitting .293/.375/.563 with 26 homeruns in his first season in AAA. He has great raw power but swings and misses a lot and is still raw for a guy who will be 24 on September 1st. He has the wheels to play center but is better suited for left and could have been starting there next year for the Dodgers but they wanted a future back up catcher in Tim Federowicz with no bat and two future right-handed relievers in Stephen Fife and Juan Rodriguez. On top of this they are holding on to aging veterans when they need to save money and rebuild. The Twins proposal of Span for Storen and not trading Cuddyer: Why would the Twins, who need to be selling high on Michael Cuddyer, be trying to trade Denard Span, a true center fielder who was well on his way to a 5 fWAR season, for Drew Storen, a potential 1 fWAR reliever? Don’t get me wrong, I really like Storen, but Span was having an All-Star year and has that potential moving forward and Storen is a reliever. You don’t make trades like that. What you do is make trades that involve soon-to-be free agents named Michael Cuddyer and Jason Kubel who are hitting .298/.370/.477 with 16 homeruns and a career high 138 wRC+ while playing multiple positions and .303/.356/.444 with a 126 wRC+ all while the market is hot for hitters. The non-moves by losing ball clubs: I have no idea why the only move the A’s made was trading Brad Ziegler. I do like the trade because they got Brandon Allen in return but they held on to too many pieces that could have netted solid returns like Coco Crisp, Josh Willingham, Conor Jackson, Michael Wuertz, Brian Fuentes, and Grant Balfour. The Cubs also held on to guys like Kerry Wood, Aramis Ramirez, and Carlos Pena. I can only imagine the return they’d get for Ramirez who has 19 homeruns and passable defense at one of the worst hitting positions in 2011. The Royals held on to Melky Cabrera, 2010’s worst player who is having a career year hitting .304/.340/.466 with 13 homeruns and 14 stolen bases and, amazingly, passable defense in center and, amazingly, great base running with a +3.9 Bsr. They also held on to Jeff Francoeur who was hitting .272/.326/.464 and an excellent +4.1 UZR in right. The non-moves by winning ball clubs: The Yankees decided to stand pat and not add a needed starting pitcher for the second deadline in a row. In fact, the most talks surrounding them were about reliever Heath Bell and it was wise of them not to pay heavily for something they did not need. The Angels sat around and complained about the price during the deadline rather than adding a legit bat. The Rays, who had pieces to sell and buy, did absolutely nothing. They could have been the biggest buyers with their farm system and not even traded their top 3 prospects. They desperately need bats and I do not blame them for holding on to B.J. Upton, Casey Kotchman, or Johnny Damon if they think they are still contenders in the AL East. But, if they happened to be sellers why did they not make a deal involving Upton, Kotchman, Damon, Joel Peralta, Kyle Farnsworth, Jeff Niemann, Wade Davis, or Alex Cobb? Heck, why didn’t they make a trade imvolving a pitcher for a bat anyway. They could have still been contending and helped their 2012 club with the right bat. With the trade deadline rapidly approaching, many deals have been made. A lot of the big names that have been dealt thus far have been outfielders. Heading into the deadline, teams showing interest in an outfielder were the Phillies, Braves, Indians, Pirates, Giants, Nationals, and a few others. The top guys on many teams’ lists were Carlos Beltran and Hunter Pence. Well both of those guys are off of the market and now teams are looking at other options. We have heard names like Denard Span, Josh Willingham, B.J. Upton, Ryan Ludwick, Carlos Quentin, and last but not least, Michael Bourn. With Beltran and Pence off the board, I think Bourn has to be a top target for any team looking for help in the outfield, especially in center. Preceding the Hunter Pence trade, Astros GM Ed Wade said that he was keeping an open mind on trades and with Bourn drawing interest, I think we could see him being dealt. Bourn is having the best year of his career thus far and is amongst the league’s best outfielders. He is posting a career high across his triple slash line of .306/.367/.409. He has 129 hits which ranks 3rd in the NL and first amongst outfielders. He also leads the entire majors in stolen bases with 39. Looking at those stats, Bourn ranks right up with them in the average and OBP department. He has the third highest WAR out of the group, and with the two guys ahead of him off of the market, he has the highest. While he doesn’t offer the power numbers that some of the other outfielders have, he is an excellent leadoff hitter and that spot in the order isn’t expected to have much power. A team that acquires Bourn would get an excellent hitter, terrific speed, and great defense. His UZR of this season doesn’t tell the story as he is a great defender and his UZR is typically amongst the best in the league. Bourn will be making $4.4MM this year at the age of 28 so he isn’t too expensive. I think the Braves really should look at Bourn as he would be a great fit. He wouldn’t be as expensive as B.J. Upton and he would still provide great production. The Braves need an improvement in centerfield as well as in the leadoff spot in the lineup and Bourn would provide exactly that. The next couple days should be very interesting and crazy and I look forward to seeing if Bourn is dealt and where he ends up. The New York Mets have been making the headlines for most of the wrong reasons in recent years. Owner troubles, financial woes, star injuries, and potential trade suitors for the stars that do perform. One star that is performing this year, better than pretty much everyone in the entire National League, is shortstop Jose Reyes who will be my starting shortstop on my All-Star ballot. Reyes is the current NL leader in fWAR with 4.3 as well as batting average (.338), triples (13), hits (107), and he ranks 2nd in stolen bases (26). His overall line sits at .338/.382/.511 with a wOBA of .395 and wRC+ of 153. His base running (Bsr) has been outstanding at +2.4 and his defense has added value with a +0.2 UZR. If the season ended today he may very well win the NL MVP award. 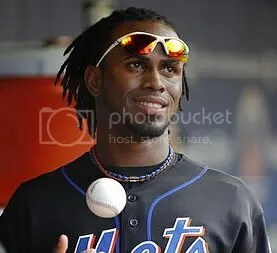 So, are there any other Mets that will join Reyes at the Mid-Summer Classic in Arizona in two weeks? I truley doubt it. But, here are the best candidates to do so. Carlos Beltran is 2nd on the entire team with +2.3 fWAR. The move to right field has been an okay transition but I thought he would have a better UZR than -0.3. Up unitl 2009, when he started battling injuries, he was a plus-plus base runner. His Bsr stands at +0.1 for the season. Maybe his knees are starting to heal properly but only time will tell. His overall offensive production has been very solid at .276/.370/.479 with a wOBA of .372 and wRC+ of 138. He is having a very good season but there are eight other NL out fielders having better overall seasons right now. The last option to join Reyes at the game would be reliever Francisco Rodriguez. He would in no way, shape, or form be on my roster but let’s take a look at the numbers. He has a 0.6 fWAR which is good for a 16th place tie in the NL among relievers. He does have 20 saves and people, for some odd reason, love saves. Bleh. He has a great 10.25 K/9 and 3.02 FIP but there are too many reliever that have been better this year and I only include three relievers, tops, on my ballot. The starting rotation has no viable All-Star options at this point with Jonathon Niese leading the staff with a 1.4 fWAR and 3.49 FIP to go with his 3.70 ERA. The All-Star game is just over two weeks away and at this point I can only see one Met making the All-Star squad and that is Jose Reyes unless, of course, he is traded prior to the game, in which case Carlos Beltran would be the next best option. I was so excited to see that Fangraphs has added UBR (Ultimate Base Running) to the site and more importantly to fWAR. I have been longing for a value stat like WAR to add base running. It already has offense, defense, and positional adjustments; it was missing base running. fWAR is evolving into an even better stat and carrying more weight than almost any other metric out there. **Since it’s inception in 2002 the worst base runners in the league are: Paul Konerko (-44.2), David Ortiz (-40.5), Jim Thome (-33.9), and Pat Burrell (-30.6). **The best base runners have been: Juan Pierre (43.6), Chone Figgins (41.7), Jimmy Rollins (33.6), and Carlos Beltran (30.5). **I am not sure how good of a base runner Babe Ruth was but I have to imagine Barry Bonds was a better one and that the fWAR totals could inch closer to each other. I would also like to see how much value it adds to greats like Ty Cobb, Willie Mays, Joe Dimaggio, and Honus Wagner. **Carlos Lee is an even worse player than we thought. He has a career -20.1 BSR and has not posted a positive BSR number since 2004. **Carl Crawford‘s value rises even more with a career 20.3 BSR but surprisingly has a -0.7 BSR this season. **What doesn’t Jose Bautista do well this year? He hits, fields, and apparently runs the bases well with a 1.9 BSR. **The versatile Ben Zobrist proves to add more value with a 7.4 BSR since he became a starter in 2009. **Nate McLouth and Alex Rios lead the league with a 2.8 BSR followed by Melky Cabrera who has a 2.7 BSR but had a -2.9 coming into the season. **Albert Pujols is the 11th best base runner since the inception of UBR/BSR with a 20.7. The next closest first baseman is the retired Shea Hillenbrand at 6.2 then Aubrey Huff at 1.1 and Derrek Lee at 0.8. Every other current first baseman with at least 750 plate appearances is at zero or in the negative. **This will hurt players like Edgar Martinez who have a get-him-in-the-hall following. He was -17.0 in just three seasons of data and I cannot imagine him being anything better than a -30 for his career. For more just head on over to Fangrpahs.com and go to Leaders and sort by BSR. Have fun!